This is part one of a multi-part series on the future of autonomous driving. Each one of these posts focuses on a different perspective on various challenges and opportunities in the design, development, engineering and legal aspects of building the cars of the future. Here is the first one, which takes a product design perspective. Hope you enjoy reading it. In areas of science and technology where rapid disruption is prevalent, researchers and engineers are constantly surrounded by several challenges of varying degrees of urgency and complexity. In a continuous cycle, innovative solutions for solving these technological obstacles are found and significant progress is made, which gives birth to new challenges. As one of the most active areas of research and development still in its infancy, autonomous driving is clearly not an exception. Such rapid pace of progress makes it more difficult to observe key challenges and opportunities in that market. Therefore, what looks like a big challenge in 2018 might be long resolved in the coming years thanks to rapid advances made in autonomous driving and other related fields. The following picture is taken around 1956. 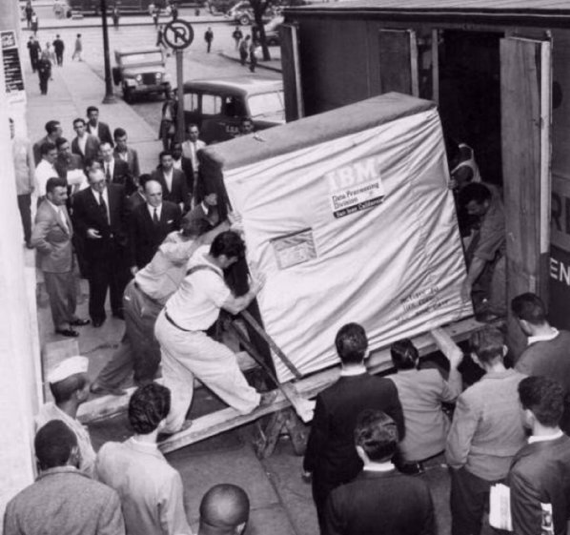 The giant box in the picture is actually a 5MB hard drive that is being shipped by IBM. What was state of the art a mere 60 years ago, would today not be large enough to contain this post! The rise of a disruptive industry such as autonomous driving usually gives birth to two sets of disruptive changes. One is within the industry itself (design, manufacturing, testing, marketing, selling and regulating autonomous cars) and the other is the lasting effect created by the disruptive industry on the external world (culture, society, government, infrastructure, and more). In what follows, we take a deeper look at the issues directly related to the autonomous cars as well as the world around them. We focus on challenges and opportunities that arise from their dissemination into our public roads, human lives and culture. While the focus of this and the next few articles is mostly on the challenges ahead, it is important first consider the broader context of fundamental benefits that autonomous vehicles have to offer. Preventing more traffic deaths, giving a never-existed-before opportunity to the young, elderly and disabled to have a more active role in the society, and freeing up our urban environments from being hostage to vehicles are just few examples of the transformative benefits of autonomous driving. There are thousands of articles and hundreds of active research labs, universities and manufacturers that are working hard on reducing plane crashes and aviation incidents. However, no one is disputing the need and the great value airplanes bring to society. The drawbacks and potential risks of any transformative technology should be viewed in the broader context of the long term benefits it provides. Self-driving cars are no exception. 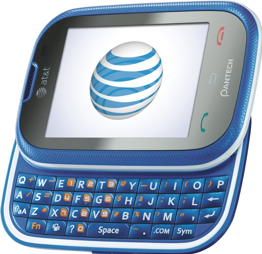 Although this phone included a few smartphone-like features such as a web browser and Facebook, the bulk of the phone’s settings and features were focused around the … phone, from easier texting with a QWERTY keyboard to “Face Tag” (which would allow users to add contacts directly from camera phone pictures). To the consumer, this was primarily a phone with some additional capabilities. If a phone did not satisfy basic phone features, additional apps and browsing capabilities wouldn’t matter much since people would not buy that phone because of its “quick access Facebook app” or the web browser. With the advent of the iPhone, this model was turned on its head. A “phone” in 2018 does not sell well if it lacks basic computing capabilities that are almost exclusively irrelevant to contacts/call features, no matter how great its speakers are or how easily one can assign a picture to a contact. Today’s smartphones are not really phones. They are modern computing devices that happen to have call capabilities as well. 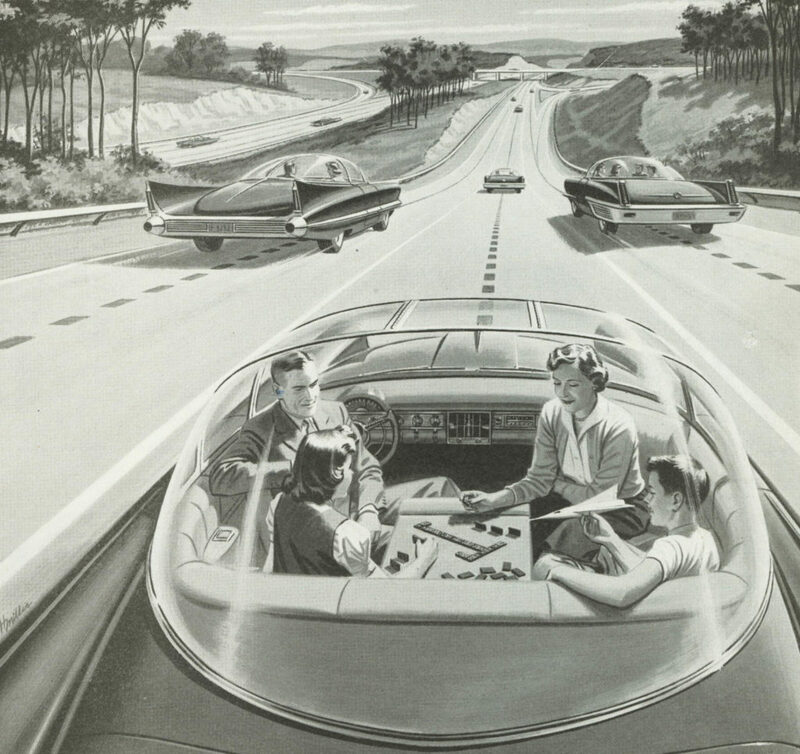 In the same sense, the fully autonomous cars of the future are not really cars either. They are intelligent entities that happen to have car-like capabilities as well. This fundamental paradigm shift will have a dramatic effect on how the cars of the future are designed, developed, tested and sold. There is another fundamental shift in the DNA of the product. 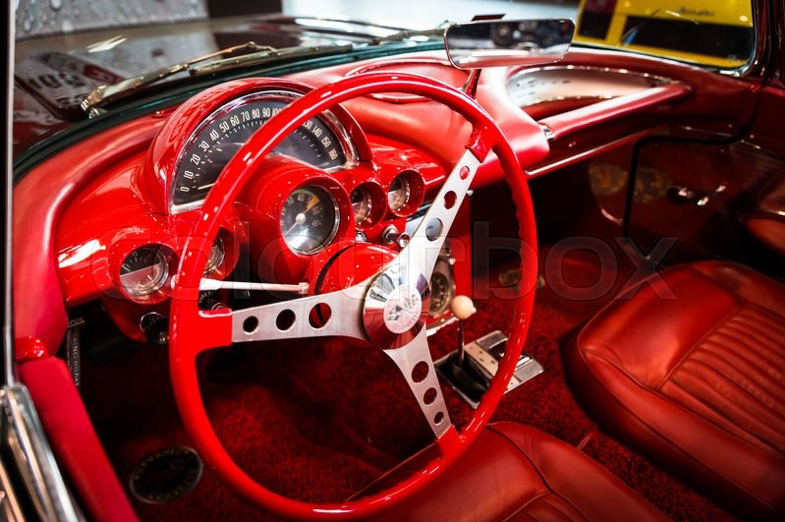 In the past, key characteristics of a car would remain the same for the rest of the vehicle’s lifetime (aside from certain degradation in quality or functionality of certain car features). The introduction of intelligent software fundamentally changes this model. Applying an over-the-air software update can suddenly turn a semi-autonomous car into a fully autonomous vehicle or enable cars to detect animals and smaller objects in addition to other large cars, essentially turning cars into computationally complex modern driving machines. Designing, developing, testing and selling such dynamic products is far more difficult. 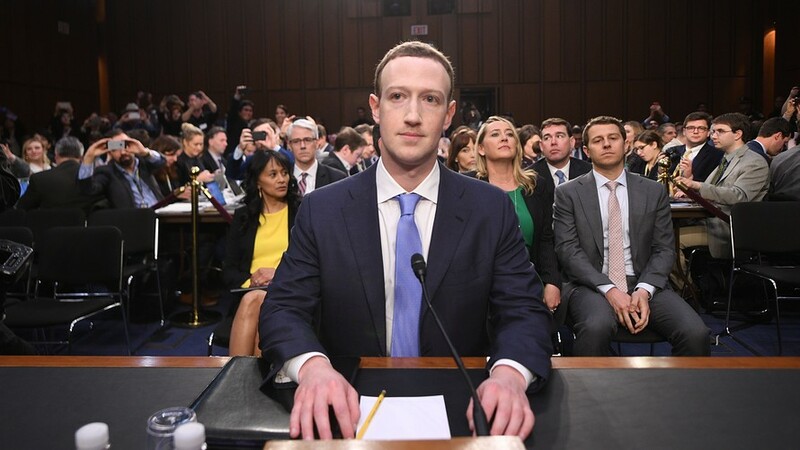 The recent challenges faced by the Congress to regulate (or at least understand) Facebook is an interesting example of efforts to regulate another complex product that is constantly changing its behavior and capabilities over time. A product that also provides a completely different experience depending on the consumer using it is difficult to understand and to regulate. Such a fundamental paradigm shift in what a car is, also drastically changes consumers’ needs, perceptions and expectations of the new product. Instead of caring about how stiff or soft steering feels, how to enable “triple turn signal” or how well the auto-dimming of rearview mirror works, consumers might care more about how effectively the car reduces noise, blocks external light, or handles sharp turns during a “sleep mode”. They might be willing to pay a higher premium for cars with larger displays, more responsive media center, better support for Chromecast, Apple TV and Skype, or high fidelity entertainment systems for a more immersive movie watching experience during the ride. However, higher expectations come at a cost: complexity and cognitive overhead. 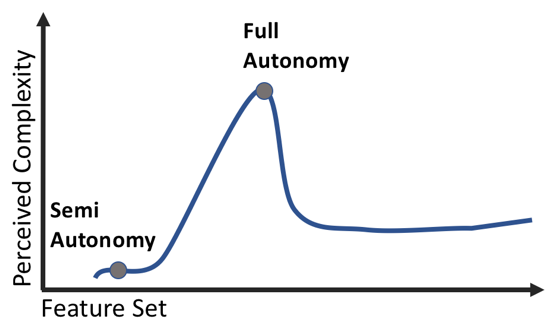 Depending on who you ask, we may be just a few years away from cars that drive themselves in any environment without human intervention (known as “level 5” autonomy). Until we get there, there will be an interim period where the cars are more capable of performing complex tasks but are unable to do those tasks fully independently. This creates a dilemma. Useful capabilities can be built into the cars such as allowing a car to detect blind spots or pedestrian traffic behind the vehicle, tilt down one or both mirrors when backing up, auto-park the vehicle, etc.. However, these capabilities create more settings, more interfaces, more things that can go wrong and lead to, generally speaking, a more complex product that is more difficult to use. In the long run, when cars reach full autonomy, there will suddenly be a much looser correlation between the technological capabilities of a car and its perceived complexity. However, in the meantime, cars cannot automatically activate and perform those tasks without human intervention. So for a period of time, the driver will need to worry about everything a typical driver currently needs to worry about … plus activating, configuring or instantly disengaging these additional intelligent features, knowing their limits and knowing when and how to use them. This has created concerns about the potential for more driver distractions in the near term and more cognitive overhead and resilience to technology-packed cars in the long term. Although some of these issues are avoidable by using other visual alerts alongside (or in lieu of) the audio signals, creating signals that are easy to distinguish and don’t confuse the driver is not an easy task. Even if and when the driver understands what is wrong, he or she still needs to navigate the software interface to correct the issues. However, a fully autonomous car might detect any of the above (or hundreds of other similar) events and know how to handle them without even bringing them to the attention of the driver. Current cars are equipped with advanced breaking, airbag deployment, fuel injection and hundreds of other complex technologies that the driver is completely oblivious to simply because the driver’s decision is not needed in determining what should happen and when. This dilemma is not new in technology. The first generation of mobile devices, smartphones, smart fridges, car phones, and PCs exhibited a similar trend. There is also the innovator’s dilemma that further complicates everything discussed above. Furthermore, designing more complex cars with higher degrees of reliance on software also creates a different type of user interface challenges. 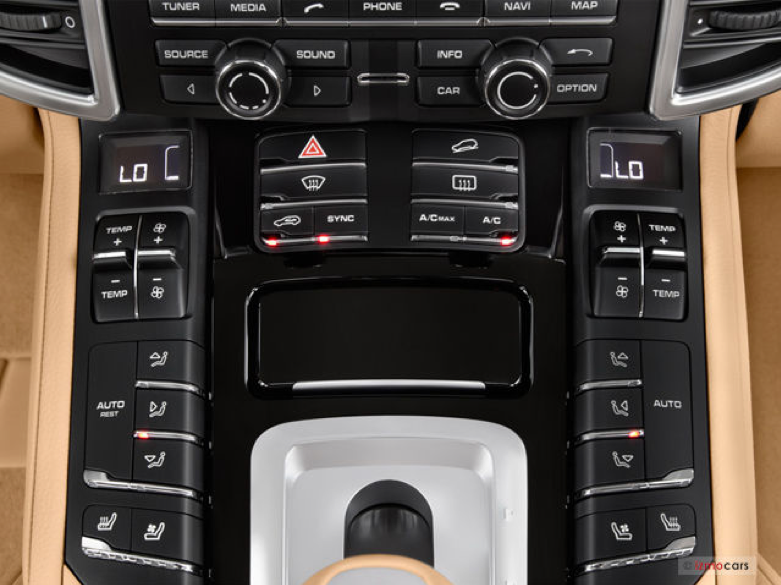 As vehicles get smarter, more of the car’s mechanical controls, knobs and keys are converted into electrical components controlled via the central digital display or the electronic instrument cluster. These controls are traditionally easily accessible, easy to reach, fixed in a physical location, and memorized by drivers who can access them without looking, or even in the dark. In other words, new complexities can arise from this trend toward “simplification”. Performing simple tasks like unlocking the doors, folding the mirrors or turning up the heat may require navigating an interface and making a few clicks/touches. 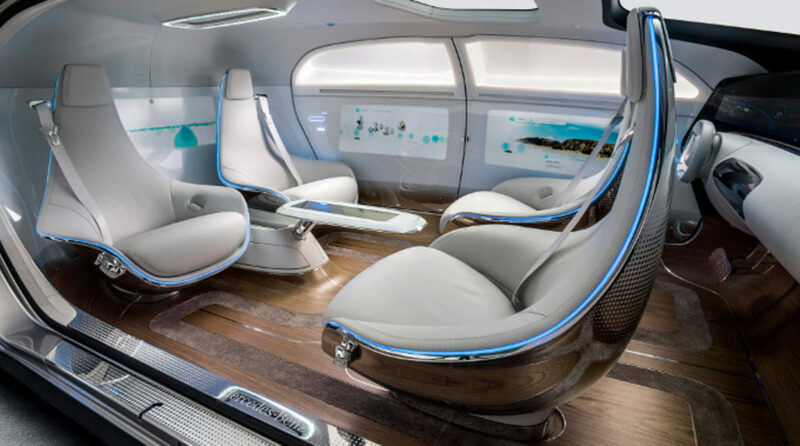 What if those functionalities are critical to the safety and/or comfort of the occupants? What if a driver needs to immediately turn on the windshield wipers to see what’s in front of the car or stop a blasting heating/AC fan to hear a cop’s warning over loud speakers? It might take a modern technology-packed car more than a minute until all software components are fully loaded and are accessible. What if the driver has to wait for the car to “boot up” before being able to access some key functionality? Moreover, having isolated physical keys controlling independent car functions minimizes the side effect of a malfunction of a component on other parts of the system. But putting them all together in a software system introduces the possibility of more interference. If a software glitch exists in the voice control module, it can potentially crash the entire operating system which would prevent access to all other functionality embedded in the software system until a complete reboot. Product designers have been facing similar issues creating other smart products. Many Smart TV manufacturers have been introducing more “smart” features into their products over time. These features require additional storage, computing power and more complex means of interactions. 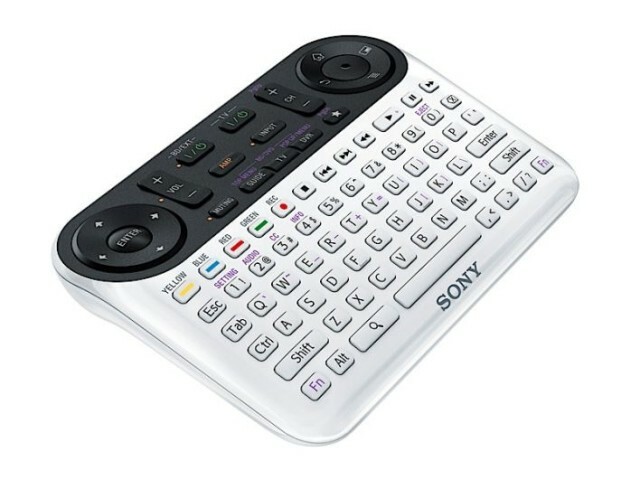 However, the leading TV makers were reluctant to introduce mechanical hard drives to TVs or make major improvements to the good old TV remote (which is why several TVs ship with two remotes). It is easy to see why. The TV’s mute button should always work instantly, regardless of how many “apps” the TV can run. The channel up should instantly “channel up” regardless of the HDD capacity and how many bad sectors it might contain due to turbulence sustained during shipping. A TV, as a communal device, is being shared by several users at home. TV watchers 5 to 90+ should all be able to at least use and access basic TV functionality. So regardless of what the TV is capable of doing, it provides a simple interface (a dumb remote) to allow instant, continuous and reliable access to key TV functionality. Similarly, a compromise needs to be struck between introducing a technology-packed vehicle and giving assurances to users about the accessibility and reliability of core car functionality. Perhaps most importantly, it is one thing for a TV app to crash due to a software glitch, it’s another thing for the auto-pilot “app” to crash while driving at 80 miles per hour. Recent recalls from BMW due to improper illumination of car’s instrument panels or the recall of more than 30,000 cars by Jaguar Land Rover due to instrument clusters going blank are just two examples of what can go wrong. 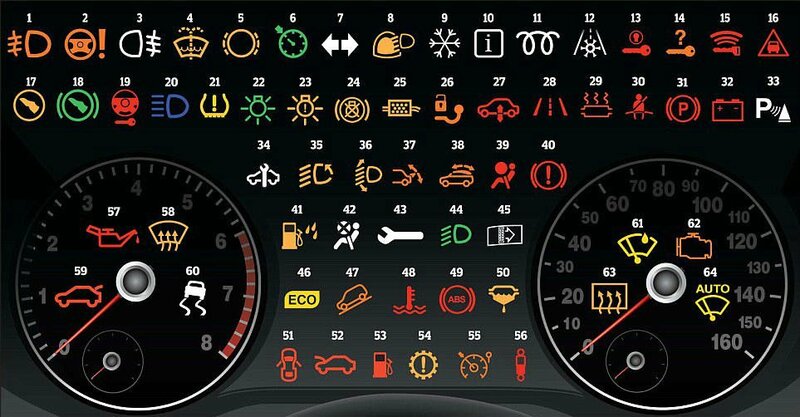 Thankfully, car manufacturers are cognizant of these challenges and tend to separate key car functionality (blinkers, windshield wipers, horn, parking break, etc. ), which needs to be accessible at all times, from less mission-critical features (such as heated seats, navigation, and apps). Also, more advanced voice recognition technology has created easier ways to operate Bluetooth, navigation, media and other less critical car functions. The next posts in these series study the challenges in developing fully autonomous vehicles from software engineering, legal, safety, privacy and security perspectives and also discuss the long-term impact of the autonomous automotive industry on the broader ecosystem of modern societies.